Suffolk County Crime Stoppers and Suffolk County Police Second Precinct Crime Section officers are seeking the public’s help to identify and locate two people who stole merchandise from a store in Huntington Station in January 2019. 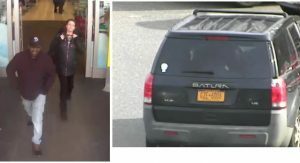 A man and woman stole three Fitbit watches from Target, located at 124 East Jericho Turnpike on January 10 at 12:30 p.m. The watches were valued at approximately $480. The two fled in a black Saturn VUE with New York State license plate GZE 6006.